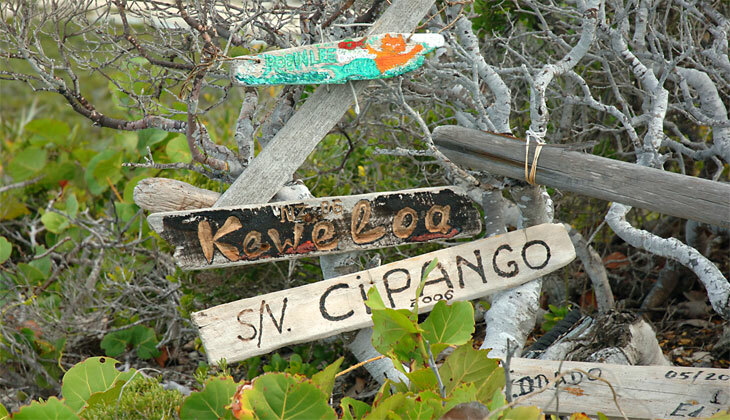 The highest hill in the Exumas Cays Land and Sea Park is called Boo Boo Hill located about a mile from the ranger station at Warderick Wells Cay. Boo Boo hill isn't just any hill. It is special because the summit is decorated with mementos from yachts who visit the Land and Sea Park. Each yacht takes a placard, pennant, flag, carving, painting, or inscription, and places it on the hill among hundreds of other similar memorials to their visit. Donna is standing next to a Brazilian flag on which the names of the yachts TXAI and EXIT ONLY have been inscribed. We cruised the Exumas in the company of Txai, and they donated the Brazilian flag with the inscriptions. Now both Txai and Exit Only are memorialized on the summit. It's fun to check out the names of the yachts and see the different approach used by each vessel to record their visit. Most people specialize in the signpost style, carving their names in planks and then attaching them to a tree or stake driven into the ground. A few sailors express their individuality by painting their yacht's name in bright colors on a plank. In this picture, the artists have used a turquoise theme consistent with the turquoise waters of the Exumas Banks. These classic signposts do an excellent job of identifying the yacht and telling the month and year of their visit. Some signs have the name of the yacht carved in relief, and the most elegant ones leave room to carve the dates of future visits on the same piece of wood. Quite a few yachts have made four or five visits to Boo Boo Hill. Non-conformist sailors choose offbeat ways to express themselves when they make a visit. This painted animal skull is one of the more extreme examples of how one yacht made his trip to the summit stand out from all the rest. Yachts are an expression of their owner's personality, and in a similar manner, the mementos they leave on Boo Boo hill reflect their personality as well. I wouldn't attempt to psychoanalyze someone based on what I see on Boo Boo hill. On the other hand, we live in an image-oriented world, and everything we do makes a statement about who we are and what we think is important. Each sign has a story to tell, and although the sign may be only the tip of the proverbial iceberg, the signs are not silent. Based on what I have seen in the signs, I now have a list of yachts I hope to meet. If you would like to see more pictures of the signposts, paintings and carvings from Boo Boo Hill, go to the photo gallery page and click on the Boo Boo Hill portfolio. You will be amazed at how resourceful and creative the sign makers are, and you might even start carving on your own plank that you can leave with pride when you make your own climb to the summit of Boo Boo Hill.